This Brain Teaser Quiz Question will make you think outside the box. This is Tough Brain Teaser for Genius Minds. 98% people will fail to answer this Thinking Outside Box Quiz Brain Teaser. Lookout for giving a Mensa Test in case you are able to think outside the box and crack this Brain Teaser? Can you solve this Thinking Outside Box Brain Teaser? 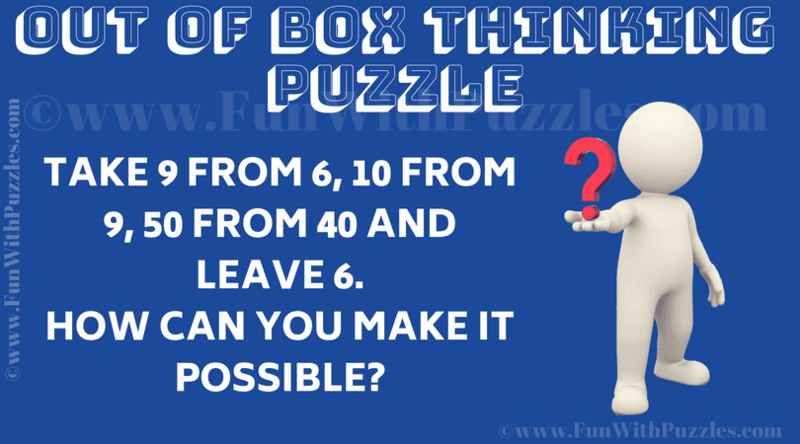 Answer of this "Thinking Outside Box Quiz Brain Teaser", can be viewed by clicking on answer button. Please do give your best try before looking at the answer.